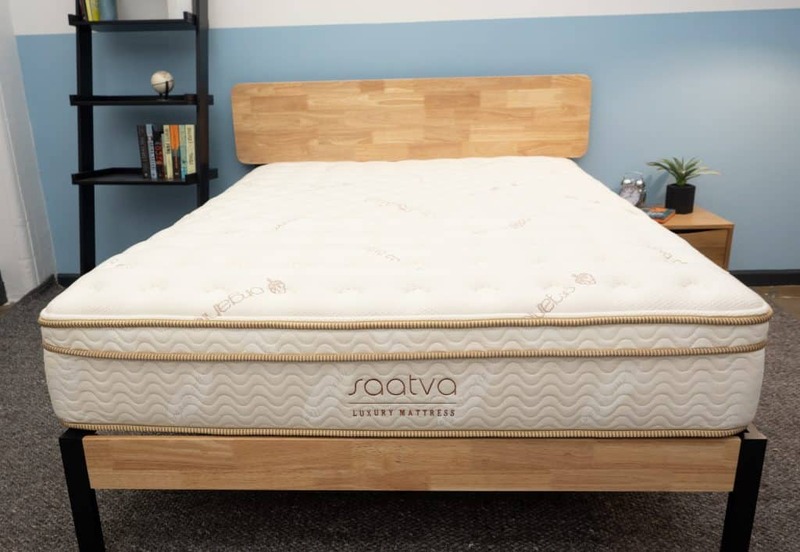 Saatva Mattress Review - Great Value for a Luxury Innerspring Bed! For this review, I’ll be checking out one of the most popular innerspring mattresses on the market: the Saatva. Built with gentle memory foam and a sturdy coil-on-coil system, this bed was designed to offer folks a luxuriously supportive sleeping experience, and all without breaking the bank. Hmm… this sounds fantastic, but is it too good to be true? I won’t know for sure until I hop on the bed and try it out for myself. So come along with me as I test out the Saatva’s motion transfer, sinkage, pressure relief, and bounce to figure out if it might just be the bed of your dreams! Don’t have time to read the whole review? No worries! Skip on over to my review summary. Otherwise, let’s get started! 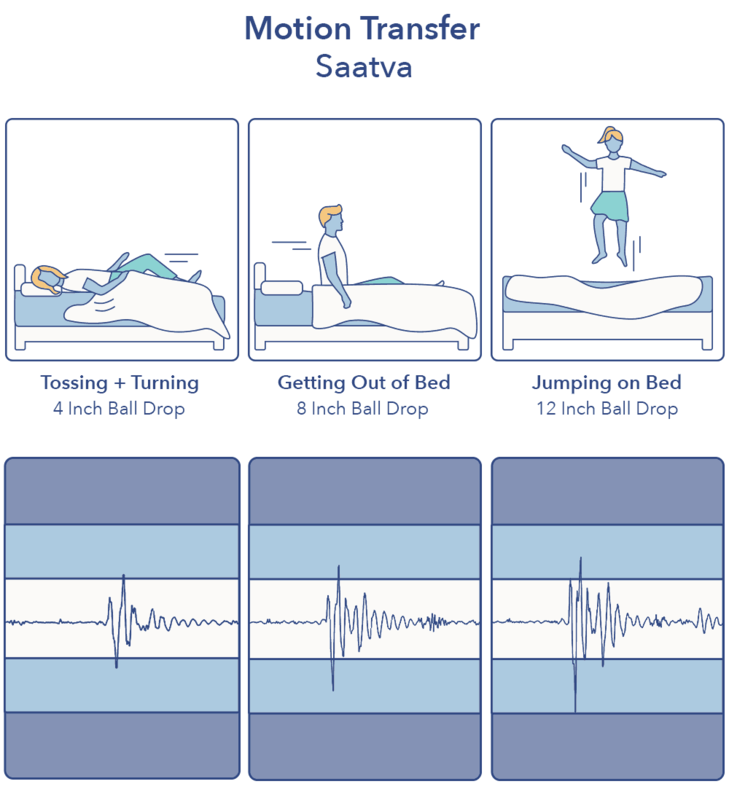 One of the earliest pioneers of the direct-to-consumer mattress movement, Saatva officially got started in 2011 with its namesake innerspring bed. 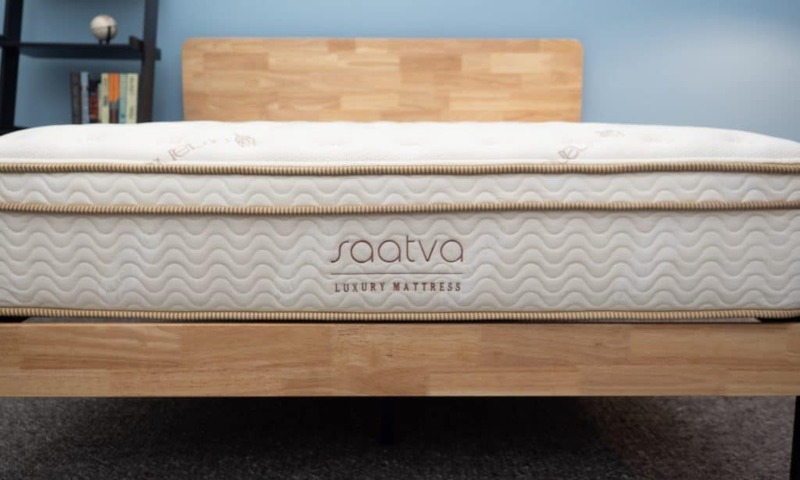 Over the next few years, the company would release two other mattresses under the Saatva name: the all-foam Loom & Leaf and the eco-friendly Zenhaven latex mattress. While we won’t be digging too much into these others beds in this review, I will be taking a little time later on to compare the Saatva to both the Loom & Leaf and one of its biggest competitors, the Casper mattress. But before we do all that, let’s bring it on back to the bed of the hour and get into its construction! What is the Saatva Made Of? 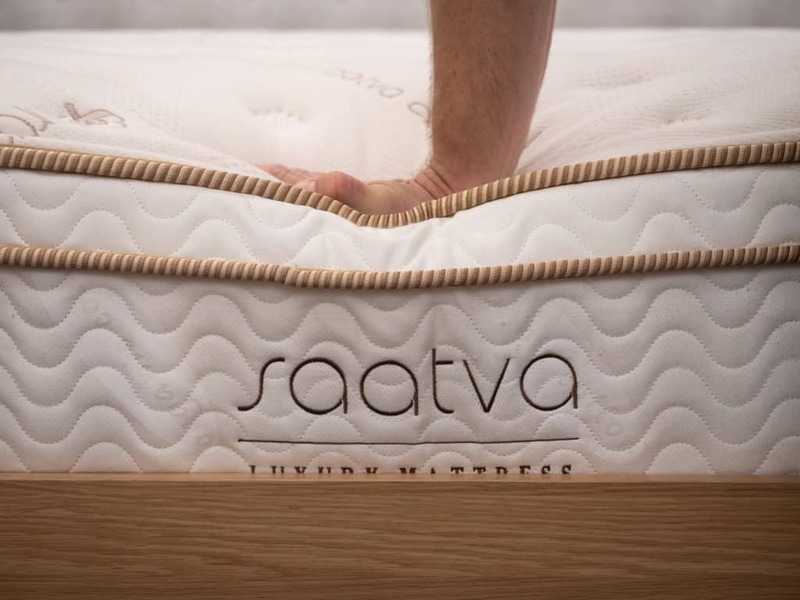 The Saatva is a unique product in the modern mattress space because it’s an innerspring, not a bed-in-a-box hybrid. This means it’s got less foam and more springs, resulting in a feel similar to the traditional innerspring mattresses of yore (think the bed in your grandma’s house). While this vibe isn’t ideal for everyone, it can be a great fit for those in need of extra support. Another thing to note about the Saatva mattress is that it actually comes in three different firmnesses: Plush Soft, Luxury Firm, and Fim. I’ll touch on all three throughout the review, but am only personally testing out the Luxury Firm model, designed to be just about medium firm. All that considered, let’s dive under the covers and see what’s going on inside! Support – Below the pillow top, you’ll find the main support system of the mattress, built with a layer of steel coils and foam edge support (wrapped around the coils to maximize the bed’s surface area). The coils here work to double down on the bounce of the pillow top springs, producing an even more powerful lift. 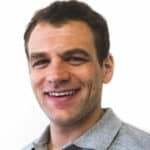 How Firm is the Saatva? Now that we’ve got the construction specs all squared away, let’s get into how the Saatva feels! To start the conversation, I thought we’d go over its firmness (again, looking only at the Luxury Firm model). Pressing my hand into the mattress, the first thing I notice is how cozy the quilted cover is. It’s soft under my fingers and provides some pleasant pressure relief. Pushing in further, I can feel my hand pressing through the thin layer of memory foam and hitting the first layer of pocketed coils. It’s immediately bouncy, and only gets bouncier the harder I push, which tells me this bed is likely to do a fantastic job of lifting the sleeper up and out of the structure. Alright, now I’m ready to jump on this bed and see how it feels on my back, stomach, and side! But I won’t just be relying on my own experience to figure out how firm the Saatva is — when speaking about firmness, I think it’s super important to involve other folks. And why? Because everyone feels mattresses differently, so I want to provide you with a wide range of perspectives. To do this, I invited three of my coworkers to come test out the bed with me. After we all gave it a go, we shared our personal firmness ratings, which I then averaged out to the score you’ll see on the graphic below. 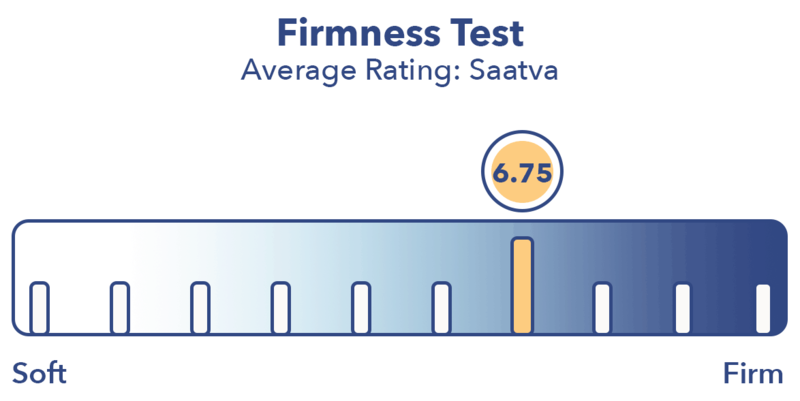 We were all pretty much in agreement about the firmness of the Saatva, landing on an average rating of 6.75. 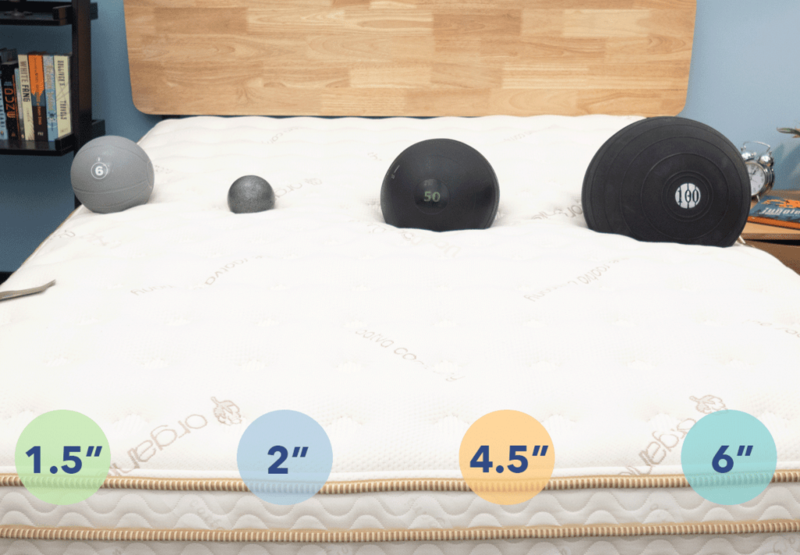 When compared to the industry standard of 6.5 for medium firmness, it seems that this bed is just a touch above medium firm. I personally gave the mattress a 7 as I found its coil-on-coil construction to produce quite a firm feel. While it’s true that you’ll likely experience a little give with the quilted cover and memory foam comfort layer, the bulk of the bed is made up of its different coil systems, which really sets the tone for its overall vibe i.e. bouncy and taut. This may not be the best feel for strict side sleepers (which we’ll get into more specifically below), but could be great for combo sleepers in need of excellent mobility. I’ll also remind you that we’re only talking about the Luxury Firm Saatva here. According to the company, the Plush Soft version lands somewhere in the 3-5 range, allowing for more sinkage and pressure relief at the shoulders, while the Firm hovers at about an 8 on the firmness scale, providing better support for the hips. Another important component of feel is pressure relief. If you’re a human being (which… I assume you are), you likely experience some aches and pains at your lower back, hips, shoulders, or joints. Therefore, your bed needs to be able to alleviate as much of this tension as possible so you can get a restorative night’s sleep. 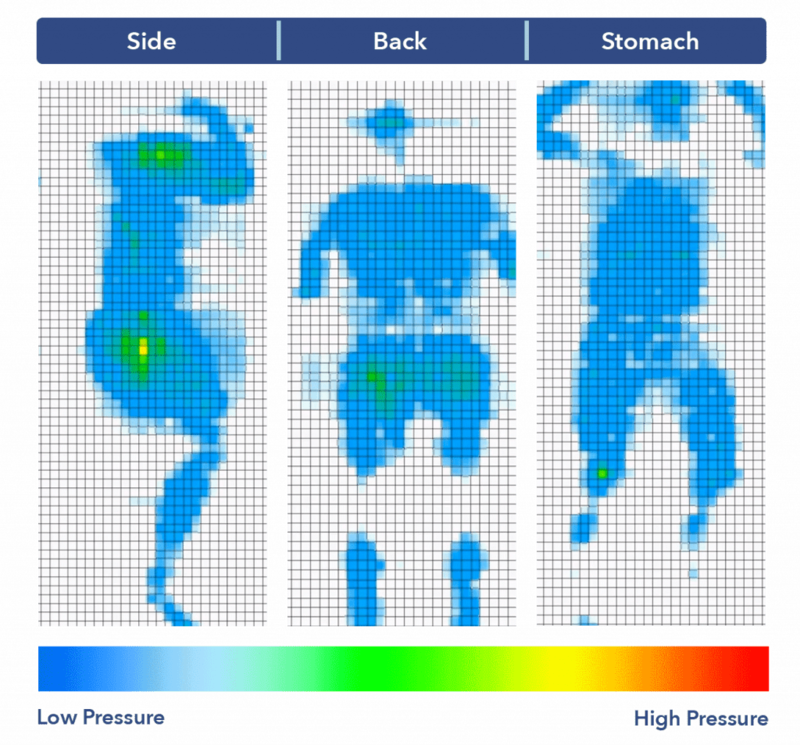 To demonstrate the Saatva’s ability to relieve pressure at sensitive spots along the body, I’m going to stretch out on a pressure map! As I move around the map, it’ll create a visual representation of how I’m interacting with the bed: all blue means I’m experiencing little pressure while red means we’re getting into uh-oh territory. Back – Lying on my back, I felt as though my weight was evenly distributed across the surface. 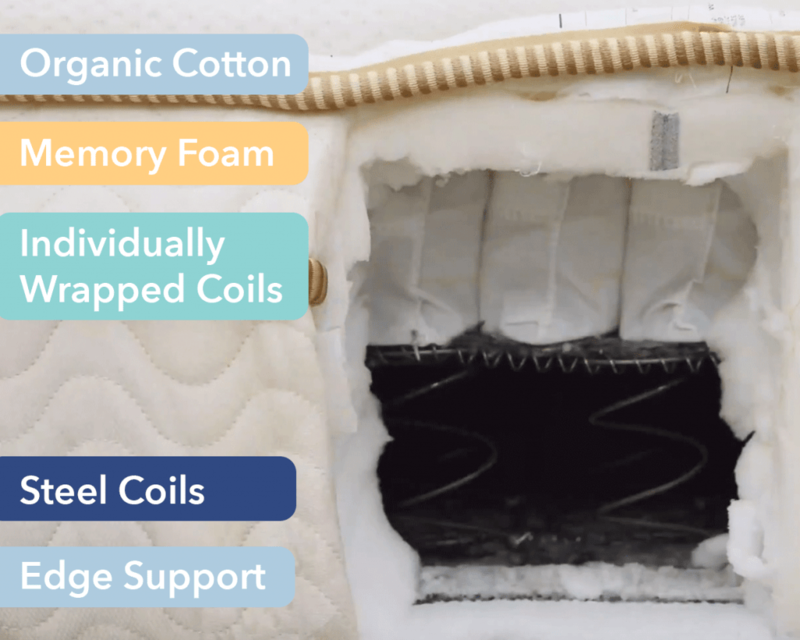 I could feel the quilted cover and memory foam comfort layer filling in the space at my lumbar region for some nice pressure relief, but mostly what I experienced was the buoyant lift of the coil-on-coil construction. This kept me positioned on top of the bed, making it incredibly easy to move around and change positions. Side – Rolling onto my side, I began to feel a bit of discomfort. In this position, I could feel a bit of pressure starting to form at my hips and shoulders (which you can clearly see in the graphic above). Strict side sleepers tend to prefer softer structures that produce more sinkage and body-contouring, so I’m not sure I would recommend the Saatva Luxury Firm for these sleepers. Stomach – Turning onto my stomach, I actually felt pretty good! The firm support of the coil-on-coil construction lifted my spine into a healthy, natural alignment by placing my hips in line with my shoulders. Though I’d say this bed could be a decent fit for stomach sleepers, I think it’d probably be better suited for combo sleepers who need to move through different positions in the night. If you are a strict stomach sleeper the Firm option could be the way to go. In this next section, we’re going to put a pause on the Saatva-specific talk and get into some of its biggest competition in the space. As I mentioned above, this means we’ll be comparing it side-by-side to both the Loom & Leaf and Casper mattresses. 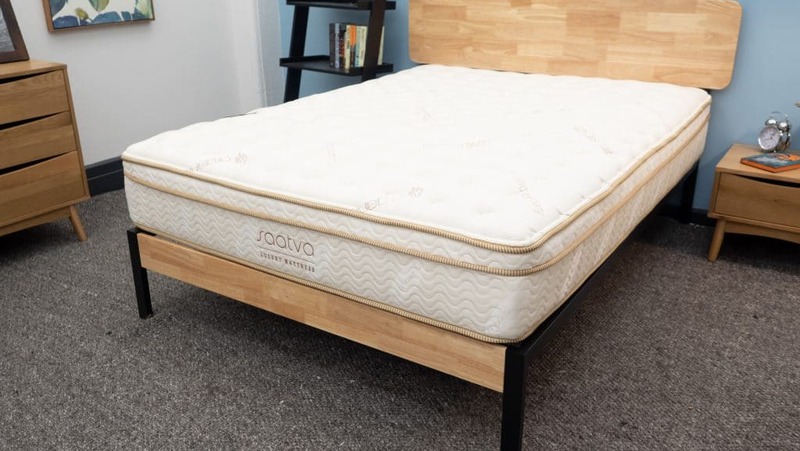 As I mentioned up top, the Loom & Leaf is also made by Saatva, but it’s an all-foam mattress featuring a ton of pressure-relieving memory foam. Costwise, it’s slightly more expensive than the Saatva, coming in at $1,299 for a Queen as compared to the Saatva’s $1,099 price tag. Arguably the most well-known brand in the mattress game, Casper is an all-foam bed-in-a-box, making it incredibly different from the Saatva (which is, again, built almost entirely of springs and does not come in a box). The Casper also features layers of Zoned Support, which help to bring targeted relief to the lower back and shoulders. When it comes to price, the Casper is the least expensive of the ones mentioned here, costing $995 for a Queen. To learn more, read my full review of the Casper mattress. You can also check out my full comparison between the Saatva and Casper mattresses. Competition aside, let’s get back to the Saatva with a motion transfer test. This assessment is basically going to show me how much movement is detectable from one side of the mattress to the other, which could be an especially important piece of information for those of you who share your bed with a partner or pet. As you can see on the graphic above, there’s quite a bit of motion transferred across the Saatva. This isn’t that surprising when you consider the tremendous bounce of the coil-on-coil construction, but is something for couples in particular to take notice of! We’ve finally arrived at our last test, which is all about sinkage! In this section, you’ll get a better understanding of how far into the Saatva you’re likely to sink aka if you’ll be positioned more “on top” of the bed or “in” it. These are fairly average sinkage results, which tells me that you’re likely to feel more “on top” of the bed than “in” it. This is consistent with what I’ve observed of the mattress thus far, and shouldn’t come as too much of a shock to the discerning reader who’s likely picked up on the fact that bounce reigns supreme in the Saatva. 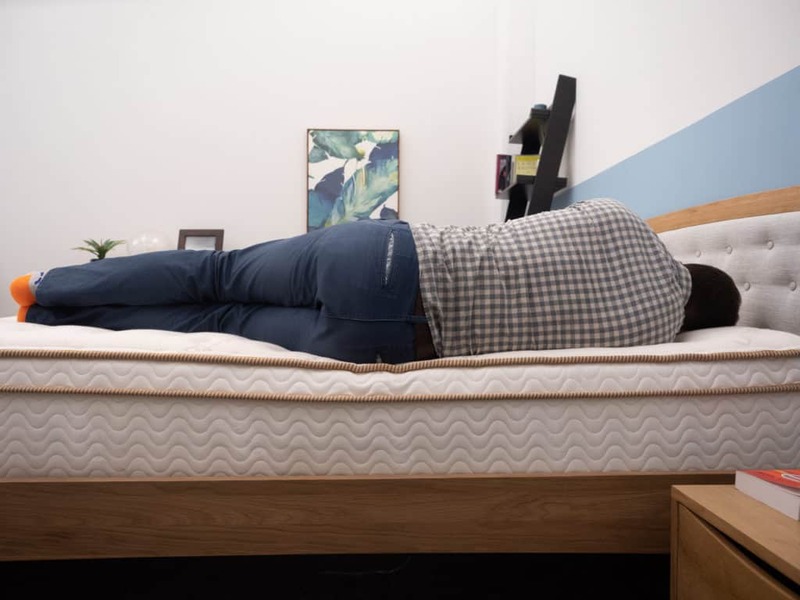 We made it to end, so now it’s time to answer the question you came here asking in the first place: Is the Saatva mattress right for me? While I can’t say definitively if it’s going to be the 100% best bed for you, I can share some final thoughts and recommendations about who I think would like it most. With its coil-on-coil construction, the Saatva could be a great fit for those after a more traditional innerspring feel. As we discussed, the Saatva is super bouncy, making it a solid option for combo sleepers who need to change positions through the night. Additionally, I think the added edge support could make it a nice pick for couples who need to maximize the usable surface area of their bed. The innerspring nature of the Saatva means there’s not a lot of contouring, which could be a deal breaker for those after some cushiony pressure relief. If I’m really nitpicking, I’d also say that it sleeps a little hot, so may not be the best fit for those in search of an ultra-cooling mattress. Just bought a Saatva mattress by telephone based on your excellent reviews. How do I apply for the $75 gift card? It’s usually automatically applied via the link on our site. I would recommend calling back and letting them know to attach it to your order number. I should let you know that the card does not arrive until after the trial period is over.